The studies – in Asia, Africa and Australia – suggest that European farmers could do more to use this low-cost option, a paper published today in the Journal of Applied Ecology said today. “Ants are great hunters and they work cooperatively. When an ant finds its prey, it uses pheromones to summon help from other ants in the nest,” said the paper’s author Dr Joachim Offenberg, of Aarhus University. A study of cashew nut crops in Australia found “pest control by ant” was nearly 50 per cent more successful than if the farmer used conventional pesticides. The quality of the crop was also higher, leading to a 71 per cent increase in income, the study found. 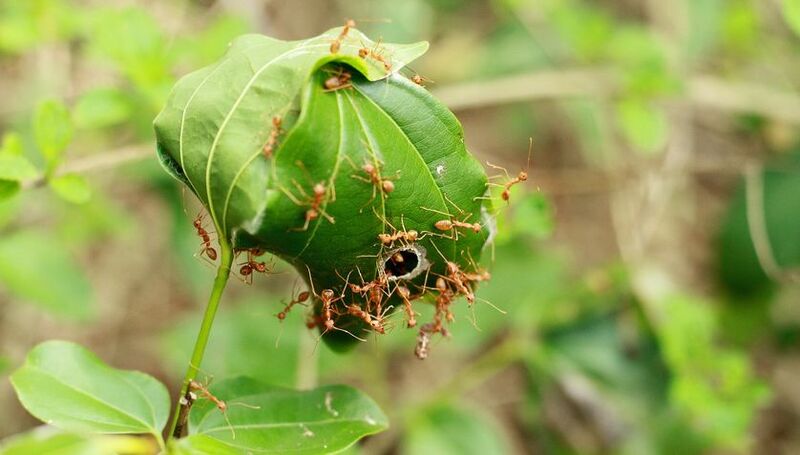 In other cases, farmers were able to mount effective defenses against pests by hanging ant nests from carrier bags from trees in a tropical forest and feeding the colony sugar solution to help it to develop. The farmers then hooked up string between the trees to create a successful defense system, with a network of ant aerial walkways in the forest canopy at minimal cost. Apart from that, a little careful husbandry – including pruning trees to ensure rival colonies of weaver ants did not fight – and watering in the dry season would lead to all-year-round protection. Studies of 50 pest species showed that ants protected crops, including cocoa, citrus and palm oil, at least as efficiently as chemicals, the paper found. Dr Offenberg, who has studied ants for almost 20 years, has suggested Europe could learn something from this and apple growers could save money by using wood ants to tackle winter moths. “Although these [examples in Asia, Africa and Australia] are rare cases where ants were superior to chemicals, many studies show ants are just as efficient as chemical controls,” he said. Ants live on every continent except Antarctica, with some estimates suggesting that the mass of all ants on Earth is similar to that of humans. Their cooperative working means that they act as super-organisms, and a single colony can weigh several kilogrames. “Weaver ants need a canopy for their nests, so they are limited to plantations and forestry in the tropics,” said Dr Offenberg. Read another interesting article about using ants to control pest here.